N. G. Shelley was a manager of the State Lunatic Asylum (later Austin State Hospital). This was a position he held until he was elected attorney general on February 3, 1862, to replace George M. Flournoy. At the end of his term he served briefly in the Confederate Army of Tennessee, under Gen. Joseph E. Johnston in the Georgia campaign from Dalton to Atlanta. Thereafter he returned to Texas, where he was commissioned a brigadier general of state troops. After the war Shelley signed the oath of amnesty at Georgetown on November 1, 1865 , and resumed law practice, this time in partnership with George Fleming Moore. In 1866 and again in 1872 he was elected to the state Senate. In 1873 Shelley delivered the oration at the funeral of Thomas F. McKinney who was a well know rancher. When Moore was appointed to the state Supreme Court in 1874, Shelley established a partnership with John Hancock. 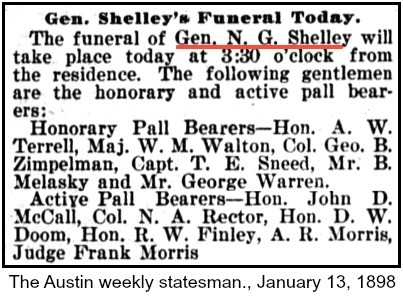 Shelley died in Austin on January 5, 1898. His papers are preserved in the Barker Texas History Center, University of Texas at Austin. He was an active member of the Independent Order of Odd Fellows. Shelley, Nathan George (1825-1898)~ Nathan George Shelley was born to William Parke Shelley and Margaret F. Etter Shelley. The family moved from Tennessee to Alabama when Nathan was a boy and he assisted his father as a brickmason. In 1841, he attended college at Emory and Henry in Virginia for one year before poverty forced him to return back home to Alabama and work alongside his father once more. In 1846, Nathan mustered into Company E of the First Alabama Infantry to fight in the Mexican War. His uncle, Captain Jacob D. Shelley was his commanding officer. After the war, Nathan returned to Alabama, studying law by night, working by day as a clerk in a wholesale grocery business and later as a deputy clerk of the circuit court by day. In March of 1849, Nathan was admitted to the Alabama bar at Talladega. He edited the Talledega Alabama Reporter before being elected in 1851 and 1853, to the Alabama House of Representatives. In 1853, he married Sarah F. Shelley, the daughter of Alabama Senator Jacob D. Shelley. They had six children together. After a year of marriage, the family decided to move to Texas for a healthier climate and on September 1, 1855, Nathan and his family established permanent residency in Austin. 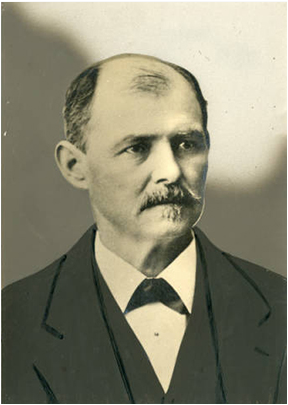 On December 12, 1855, he was admitted to the State Bar of Texas and in 1856, he established a partnership with W.H.D. Carrington. In 1861, he was elected to the state Senate. On March 31, 1861, Governor Edward Clark appointed Nathan manager of the State Lunatic Asylum (later Austin State Hospital). He held this position until his election to attorney general on February 3, 1862. Nathan served briefly in the Civil War after his term as attorney general. He served in the Confederate Army of Tennessee under General Joseph E. Johnston in the Georgia campaign from Dalton to Atlanta. He returned to Texas and was commissioned a brigadier general of state troops. After the war, Nathan signed an oath of amnesty at Georgetown on November 1, 1865, and resumed his law practice, this time with partner George Fleming Moore. In 1866, and again in 1872, Nathan was elected to the state Senate. His law partner was appointed to the state Supreme Court in 1874, and Shelley established a law practice with John Hancock. Nathan Shelley died in Austin and was an active member of the International Order of Odd Fellows. Located at Oakwood Cemetery in Austin, Texas.